Level: Intermediate. Recommended as an add-on to the “Inspiration from the Third Dimension” workshop. Basic polymer clay experience required. Colors that flow from one to the next are naturally beautiful together. One way to discover nature’s secrets of color flow is to select just one color to explore its many variations of light to dark values. Please bring a stack of paint chips or magazine clippings in many different tints, shades and tones of a favorite color. We will use these swatches in a series of fun exercises designed to teach you the secrets of value contrast. You will learn how to mix colors to match your swatches using the Maggio Mixing Map, and then select five or six variations of your color to make a monochromatic Skinner blend that sings with energy. Learn how to test your color combinations and how to make a Skinner blend with the Maggio ColorWash technique. 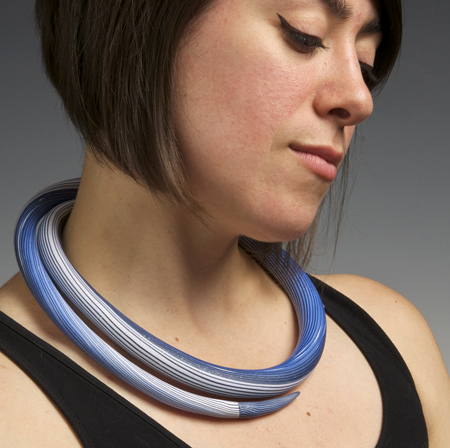 The project is based on Maggie’s Indigo series. 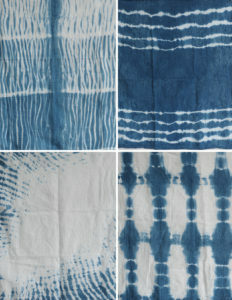 We will explore the stripe patterns of indigo dyed fabrics and learn a variety of techniques for making bracelets and collar necklaces using the ColorWash techniques in many different stripe patterns. 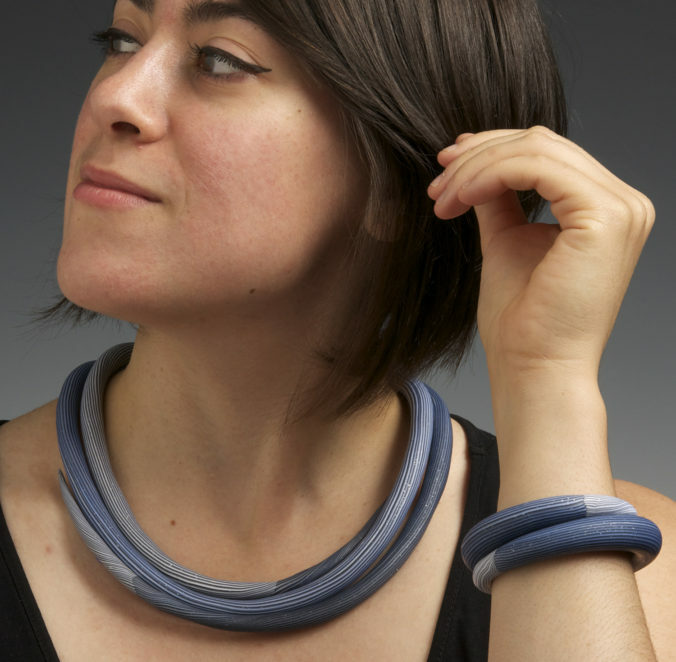 While the projects are baking, Maggie will demonstrate how to make striped split rings out of polymer clay for putting together in a collar necklace or bracelet. Kit Fee : $10 kit fee includes handouts and group supplies. Materials to Bring: Pasta machine, work surface, pin tool and blade. If possible, the polymer will be donated. If not, polymer will be ordered for the class and $20 will be added to the kit fee. Class Length: One Day. Seven hours of instruction. Instructor Fee: $100/student plus travel and lodging. Home stay is fine. Note that total cost per student is dependent on site expenses and is determined by the hosting organization. Contact Maggie for group/guild pricing. Class Size: Minimum – 8 students. Maximum – 24 students. Classroom Requirements: Demo table and chair. Dedicated convection ovens (one oven/8 students), whiteboard or flip chart with markers. Additional chair for each student at demo table if possible.